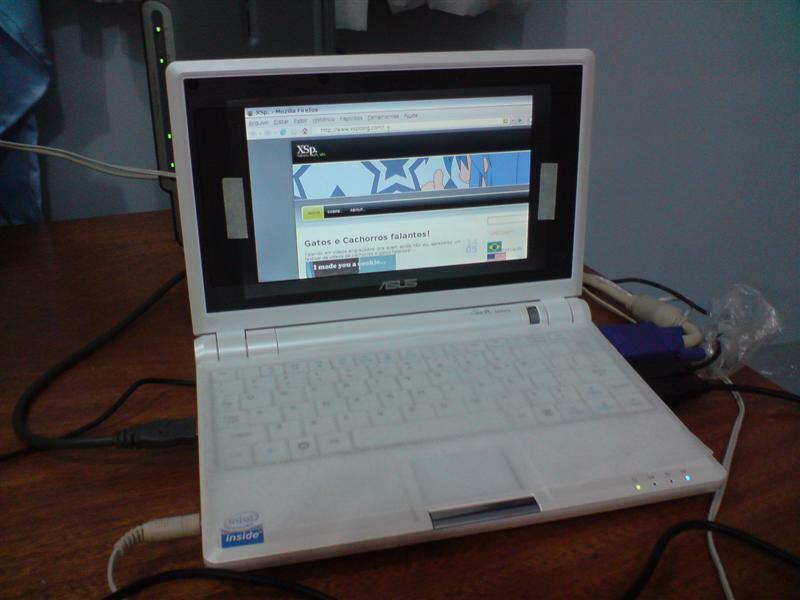 Asus EEE PC | XSp. This year’s Mother’s day I decided to buy an Asus EEE PC as a gift, since my mom needed a simple computer to write e-mails, web surfing and typing simple texts. Making use of the experience I had with the little guy, I decided to write this topic with some stuff people who are interested in buying one might want to know. Attention: I also wrote a portuguese version of this review, which also contains relevant localization information for brazilian Eee PC owners. If you wanna read it, go –> here. I bought the EEE PC model 4G – 701. When choosing a laptop, each case is particular… I bought it for my mom after considering some points. – It’s a lot cheaper than any other options I had at the moment. – It’s small and light, so you can carry it around inside a big purse or something. – With a Linux operational system (Xandros), the chances to catch a virus and having bugs or crashes are drasticaly reduced. – Since my mom uses computers for few stuff, and these stuff doesn’t include large files downloading, the EEE is good enough. Now, to the goods and bads. – It really is small and light. Even the power adaptor is small. Still bigger than you cellphone’s, but smaller than standard laptop adaptors. – The box comes with a rubberized case (neoprene I guess). Useful to protect from scratches. – As soon as I bought it, I threw an external USB keyboard, mouse and 17″ CRT monitor. All 3 worked just fine. – System interface (Linux Xandros) is very easy and straightforward for new users. – Despite having a weak processor and not much memory, applications ran ok, as long as you don’t go running lots of them at the same time. – Keyboard is tiny. Even my mom (she has small hands) couldn’t handle it. – Laptop screen is too small, resolution is low, and brightness is not that great. Without an external monitor, it would be kinda hard to use. Besides, with a 800×480 resolution, lots of webpages and apps don’t work very well (you have to use scrollbar a lot). External monitors can be set to 1024×768, which is the minimum comfortable resolution to browser nowadays. – Few HDD space. Specially because there’s only like 1.3Gb available of the 4Gb promised (Linux and pre-loaded software uses the rest). If possible, you might wanna buy the 8Gb version, though it is enough for people who only read mails, browse and type small texts. – I had problems with Mozilla Firefox browser. Some crashes and lock-ups while I was trying to load pages with Java applets and stuff (banking pages for instance). Installed Opera, and the problema became not loading Flash stuff. I had less than a week to mess with the lappie, and had no previous experience with Linux. Even so, I managed to make several modifications on the system, like changing the base language and other stuff (better covered on the portuguese version of this topic). Ain’t for the weak at heart, but with patience one can extend nicely the funcionalities of the EEE PC. Good luck to you all, and my thanks to people from several forums for the valuable tips!